An increasingly popular air conditioner and heat pump technology, variable refrigerant flow systems (VRFs) offer one way to resolve the dilemma of buildings that need both air conditioning and space heating in different zones. With VRFs, the compressor can be located outside, away from the rooms. In addition, the fan coil features a variable speed fan motor with a soft start that makes the units much quieter than the single-package water source units, according to Nall. Another plus comes when buildings simultaneously need heating in some areas and cooling in other zones. In those cases, VRFs “can meet the requirements of the smaller of the two load types with little additional energy expenditure,” Nall says. VRFs do this by pumping heat captured in the cooling zones to other parts of the building requiring heat. VRFs operate as heat pumps. In cooling mode, the outdoor unit operates as a refrigerant condensing unit, while the indoor fan coil performs as an evaporator unit. For heating, these two roles are reversed. The outdoor unit becomes the evaporator and the indoor fan coils operate as condensers. Both the indoor and outdoor units generally are driven by variable speed motors, making them “particularly efficient when operating at part load,” explains Nall. 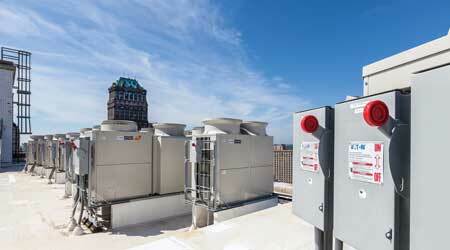 When roof space is available, air source VRFs offer options for hotels and college dorms. “They should be used with dedicated outdoor air systems to provide continuous ventilation to the space, allowing the VRF units to cycle off should no load exist in the space,” notes Nall. The difference between air source and water source systems in heating mode is that air source heat pumps draw heat from the cold outdoor air. Water source units need fuel-fired boilers to make up the heat withdrawn from the tempered-water circulating loop. Facility managers should be aware of the amount of refrigerant used in a typical system’s compressor unit, fan coils, and refrigerant piping, Nall says. ASHRAE/ANSI Standard 34 specifies the refrigerant concentration limit for each refrigerant. For refrigerant R410A, commonly used in VRF systems, that maximum concentration is 26 pounds per 1,000 cubic feet of normal space, or 13 pounds per 1,000 cubic feet for institutional space, explains Nall.